Happy Earth Day! Sometimes, actions speak louder than words. Students in the St. Lawrence University conservation biology class spent 1.5 hours this morning picking up trash at the SLU Sandbanks and also along park street. Disappointing to see how much trash people leave behind. Pollution, including littering, is one of the "4 horsemen of the environmental apocalypse" (climate change results from polluation; the other three are habitat loss/destruction, invasive species, and overharvesting). This Spring Peeper was found in Glenmeal State Forest in the town of Pierrepont. It was swimming in a small temporary pool on the remnants of an old logging road. It was a warm, sunny afternoon. 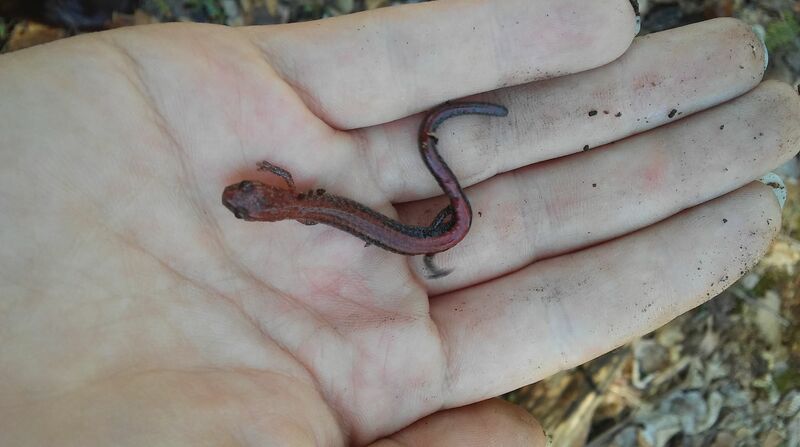 During our Herpetology lab, I found this salamander under a log in the moist soil and litter. This individual was one of the larger red-backs I've found. Happy Earth Day! The red maples are in full bloom - it is easy to forget that some of our trees are flowering plants - they flower before they leaf out, which presumably give the wind-dispersed pollen a chance to move more easily. Very lovely. 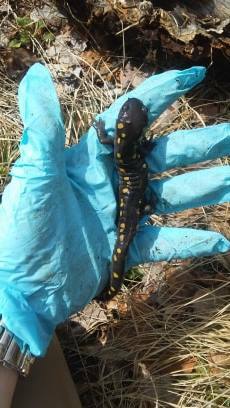 During our Herpetology lab, I was looking under some leaf litter and found this beautiful Eastern newt! 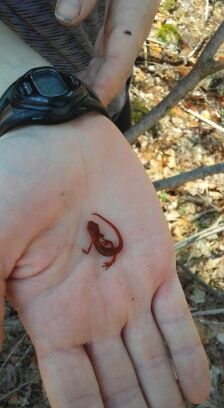 This lovely specimen was no more than 3 cm long, and has the bright orange/red coloring of the eft stage. Encountered this (alive) giant water bug as I was leaving campus at about 10 pm. These insects hibernate in the leaf litter during the winter and then emerge and migrate back to the water where they are fierce aquatic predators (but not to be feared by humans). Nice to see that this one hadn't been squished. I hope it makes it! 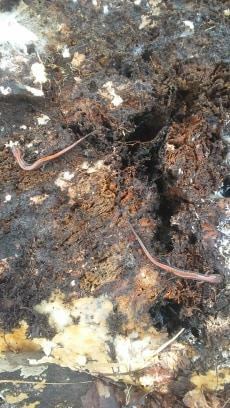 While flipping logs and stumps, I flipped a stump to find two red-backed salamanders about 5 cm apart. 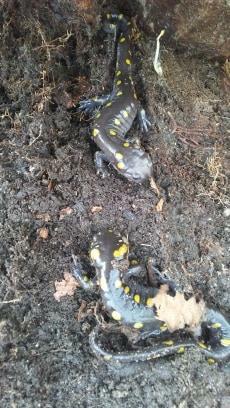 At the end of my herping for the day, I flipped one more stump to find not one, but two spotted salamanders! They were my second and third of the day, and overall my favorite amphibian (I mean look at those chubby heads and costal grooves!). This was a great way to end my day outside enjoying nature and its wonders. While I was out herping on this beautiful Saturday, I flipped a log to find this wonderful creature amongst the leaf litter! Here are a few photos that were recently posted on NUN's instagram and facebook to highlight Big Night for New York's Herps!